Since joining forces a decade ago, The Food Dudes have grown their once small, home-based operation into Toronto’s most revered, innovative and adaptive catering and food service company. Executive Chef Adrian Niman founded The Food Dudes in 2007 upon completing his intense training at the Michelin-starred Reads Hotel in Mallorca, Spain. Adrian then partnered with Creative Director Brent McClenahan, who specializes in bridging the gap between design strategy and the culinary arts. They added Chief Operating Officer Lindsay Klein soon after, built a world-class team of passionate professionals, and quickly distinguished themselves as industry leaders. The Food Dudes consistently raise the bar by anticipating and fulfilling the dynamic needs of the modern metropolitan client – a desire for fresh and local ingredients, sophisticated original fare, flexible budgeting plans – all while providing a memorable culinary experience. From catered affairs of all styles and sizes to food trucks, restaurants, fundraisers and signature food-driven event experiences, The Food Dudes are Toronto’s most trusted hospitality specialists and premier providers of all things edible. Adrian founded The Food Dudes in 2007 while still attending university. In addition to being the driving culinary force behind the Food Dudes operation, Adrian utilized his sterling business acumen in accelerating the company to immense success in a remarkably short period of time. 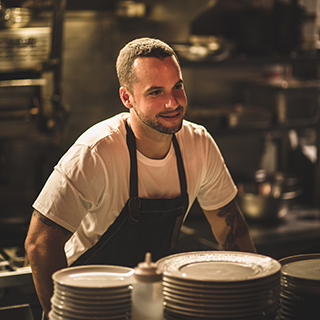 While rising to the top of the Toronto catering community, he also created two of the city’s most innovative and popular restaurants in Rasa and Pantry, both of which continue to flourish. Adrian brings a bold and adventurous passion to his work, infusing global cuisines to create stimulating flavour and texture combinations, with a constant eye on quality and originality.